2 Samuel 8:4 JPS And David captured from him, one thousand and seven hundred horsemen, and twenty thousand footmen; and David houghed [IE: "hamstrung"] all the chariots [horses] and left over of them for a hundred chariots. Rashi: and David houghed all the chariots (horses): because of the commandment: “He shall not multiply horses unto himself” (Deut. 17:16). And left over of them for a hundred chariots: which he needed for his cavalry. Now a chariot consists of four horses as it is stated; “A chariot for six hundred shekels of silver and a horse for a hundred and fifty.” (II Chron. 1:17) from here it is derived that a chariot consists of four horses. If we are talking about leaving the horse unable to stand it seems to me that that amounts to cruel and unusual punishment on an innocent animal, no? Would he perhaps have only damaged one leg, just sufficient to keep them from being a threat? Or do we know from history or grammar that David was making a point by bringing such suffering and death on the animals? And is there any reason he would not/could not simply keep them and re-purpose them? IE: What were David's action and what does it tell us about our Maker and about David? Joshua 11:6 JPS And the Lord said to Joshua, "Be not afraid of them, for tomorrow at this time, I will deliver them up all slain before Israel. You shall cripple their horses, and burn their chariots with fire." At first glance it could appear that hamstringing these innocent horses is a cruel & unusual punishment. However (as R' Isaac Moses pointed out in the comments) the Radak addresses this. The Radak states: if the horses weren't harmful, weren't forbidden to derive benefit from, and weren't from Amalek- what justification did David have in doing this? And David was uprooted. Because it is forbidden for him to raise a horse as it is written "and not to multiply horses" or to kill them, because it is forbidden to destroy something in that matter [the exceptions where it's allowed] if the animal endangered him, or if it was something forbidden to enjoy or to destroy its memory like we do for Amalek, where it says there "from ox to lamb, camel to donkey." 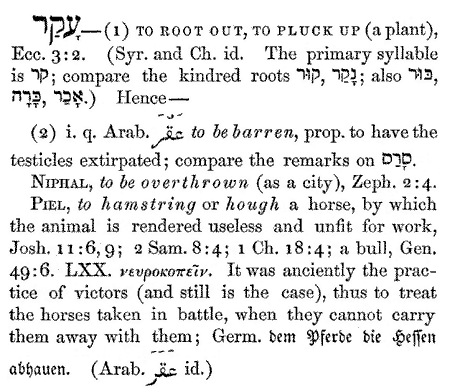 [David] uprooted (hamstrung) these horses to prevent Israel's enemies from taking them, and uprooting is permitted for enemies horses so they would no longer be fought against Israel. As Hashem commanded Joshua: You shall hamstring their horses and burn their chariots. Ie to uproot their horses and uproot his hooves from the crank and down so that she could not move. We can use this Radak to answer the other questions. What were David's action and what does it tell us about our Maker and about David? I would suggest this tells us of the tremendous care and compassion Hashem has for us. While innocent, the fact that if these horses weren't hamstrung our enemies may have used them against us, illustrates that Hashem puts our safety and primacy above all else. How a tribe that was just decimated (end of the book of judges) managed to unify all other tribes into a kingdom (beginning of the book of Samuel)?